By buying this product you can collect up to 1 loyalty point. Checkout your current loyalty points score and all available gifts via the Loyalty Bonus Page. If you want to grow your magic mushrooms as quickly as possible and with little risk for aborts, you will want to provide them with an ideal climate, specifically with the ideal temperature. At lower temperatures, your mushrooms will grow at a slower rate, with stunted growth and a higher percentage of aborts. The Magic Mushroom Heat Mat is set to 24°C, the temperature that magic mushrooms thrive best at. To avoid overheating, make sure there is space between the bottom of your grow kit and the heat mat. 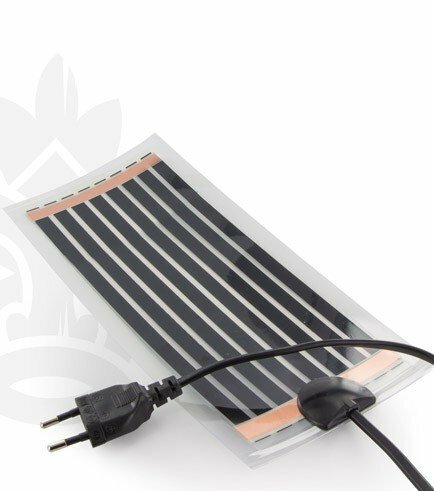 Find a way of elevating the grow kit so that air can flow freely between the heat mat and the kit. You can use anything that is heat-resistant, like bottle corks, a small wire rack or shot glasses, to prop your grow kit on, then just slide the Magic Mushroom Heat Mat underneath. Make sure that the grow kit is inside the bag cover. This helps to maintain an optimal climate for your mushrooms. You can turn the heat mat on by plugging it into a power outlet, it's simple as that. But do make sure that the magic mushroom heat mat never gets wet! Taking mushrooms can have a profound and positive effect of a person's life, but things can also go downhill and result in a bad trip. These tips can help you prepare for the experience. Psilocybin mushrooms are capable of producing powerful psychedelic trips and can be very beneficial when taken in the right settings and correct head space. You can now grow your own supply extremely easily at home using grow kits. They require minimal effort and are ready to harvest in a small time frame.